This king is another "strange presence" in the Third Dynasty; owing to his doubtful ownership of the Pyramid of Meydum it has been thought that this king with a possible reign of 24 years (Turin Canon), could have been the author of a reinassance which fortells the splendour of the reign of his follower (and son?) Nebmaat Snofru. Many of the latter's dignitaries might have lived or being born during Huni's reign. But, as we' ll see, there are only few concrete proofs of this king's reign and monuments. The Papyrus Prisse (II, 7) names Huni as Snofru's predecessor [so the foundator of Dyn. IV would be, as generally reported, the son Huni had by Meresankh I, the one who married Hetepheres I, another daughter of Huni and future mother of Khufu]. The writing of the name Huni is found in the Turin Papyrus and Saqqara king list, while it is wanting in the Abydos king list. 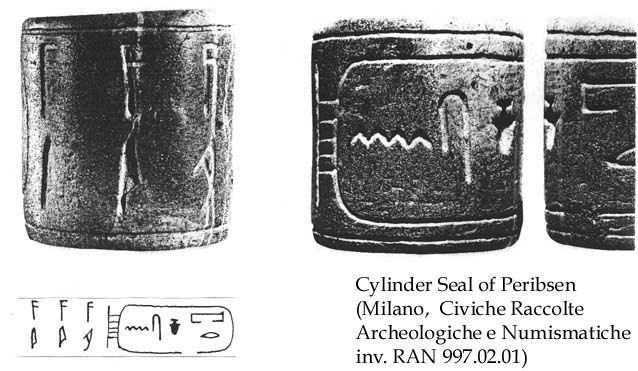 In the Old Kingdom cemetery at Elephantine, near the northern side of the (now disappeared) pyramid of the III rd dyn., a conic granite block was found (by H. Gautier in 1909) on which an inscription named a king HU or NSWTH or Nsw Hun(i) (Seidlmayer in Spencer 1996) differently interpreted (Smith in C.A.H. vol. I cap.XIV, 1971) probably related to the name of a palace: 'Diadem of the King Huni' (Barta in M.D.A.I.K. 29(1) p.1-4). The same Huni's name variant Swtenh, Nisuteh or Nswt H (w), is attested on the Palermo Stone (verso V,1) under the V th dynasty when Neferirkara commemorated this Nswteh dedicating a monument to him (Urk.I 248,12); for a mention in Metjen's tomb see below. Therefore in the late Third Dynasty we have no trace of the name of this king in the full form "Huni" (but see Heni in the Wadi Maghara reliefs of Netjerykhet - Djoser [Inscript. Sinai I pl. I,2]: Heni's title is read as that of a woman in Kahl et al. Corpus, but it might be also a Iry A'at A'mw (Responsible of the Asiatic boundary) and thus this person would represent the future king Huni as John Degreef kindly suggests me). Now we must return to the discussion of the ancient attestation of the name Niswth or Swteneh or Nswt-Hw (see bibliogr.). The basic elements of this are the 3 inscriptions in which the writing variant is Niswth, while we can overlook the MK and later sources, the writing of which must be a corrupted one, deriving from later Egyptians own misinterpretation of the original variant of the name, the same as earlier egyptologist have done (Goedicke). Hans Goedicke read the name as a nisbe Nj-Swteh (He who belongs to the one who seizes) referring the king to a god; the causative of the verb wtH or jtH (to draw, open) would be swtH (to seize); he related this name to the political program of Huni which would have been the king who finally estabilished the Egyptian dominion on the southern boundary at Elephantine. The granite cone inscription was read by Goedicke as the foundation of the Elephantine fortress by this king (now we know that previous kings were active on the island, as the clay seals of Peribsen, Sanakht, Djoser, Sekhemkhet and Khaba show). Later articles have rejected the reading of the name proposing Njswt Hwj (Barta), Hw-n.i nsw (Helck); Helck also pointed out that in Metjen inscriptions (see also below) do appear various other domains which had been read hwt Hn-sn and which could instead be read hwt Hwn (j-nsw). He proposed to read the name as 'The Defeater'. Goedicke's translation of the Sshd-Ah has been rejected in favour of 'The adhorned palace' or 'Palast: Stirnbinde der In.i-nsw-Hw'. Thus if Huni, who has his name in a cartouche on contemporary inscriptions, has to be equated with the Nswt H(u) or Nysuteh just quoted, it is likely that the pyramid on the isle of Elephantine was of his reign (the cone might have been a pyramidon). According to recent theories (M.D.A.I.K. 36 p. 43-59 ; M.D.A.I.K. 38 p. 83-93 and 94-95) it appears possible that all the little step pyramids 10-17 meters high, discovered at Zawyet el Mejtin, Abydos (Sinki), Naqada (Nubt), Khula (Hierakonpolis), Edfu and Elephantine must be attributed to a single sovereign, maybe just Huni; the Seila pyramid is more developed (the german archaeologists date it to Snofru), but the Americans (and myself as well) prefer an higher datation to the reign of Huni (J.A.R.C.E. 25 p.215) (when he had already ended the 8 steps Meidum Pyramid). Nabil Swelim (op.cit.p. 100- ff) added two more possible contemporary step pyramids: one at Athribis (reported by the Napoleonic savants; see also Rowe in A.S.A.E. 38) and another one at Abydos (Currelly, Abydos III, 1904 pl. XV, called 'Tomb Chapel of Ay' of Dyn.XII). Among these monuments the one south of Edfu, at Naga el Ghonemiya, is the only one not yet studied properly. 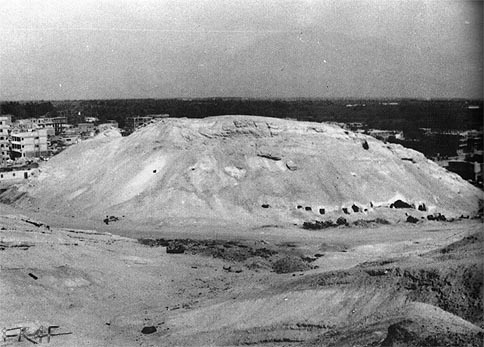 The pyramid of Zawyet el Meytin, near El Miniah, the only pyramid of Egypt built on the eastern bank of the Nile, had three steps and c. 17 m of height with a square base of 22,5m each side. It's the only (among the 'sinki') to have retained traces of a fine limestone covering . Raymond Weill (C.R.A.I.B.L. 1912) described the inner layers of walls slightly inclined towards the center with a progressively decreasing height. Similar to this one was the pyramid of Khola, near Nekhen (Cimmino 'Storia delle Piramidi' 1990 p.122-5) which was orientated with its edges (not its sides as commonly happens) towards the Cardinal Points. It was c.10 m high, the base side was 18,6. The pyramid of Nubt (Petrie-Quibell 'Naqada and Ballas' 1896 p. 65 tav. 85) three stepped , 22 m of base, had unlike the others, a central pit ; but the own Petrie declared he wasn't able to understand whether the hole was an original one or rather a digging made by violators in search of preciousnesses. For the pyramids of Abydos (SINKI) and Elephantine: M.D.A.I.K. 36,37,38 and bibl. in (Ortiz) G.M. 154, 77-91 n. 4, 40. The absence of internal chambers prevents from attempting funerary hypotheses. Not convincing are either the theories of Lauer (the little pyramids marked the main places for the reconquest of the egyptian territory by Khasekhemui or the birth-places of the queens), Maragioglio and Rinaldi ('L' Architettura delle Piramidi Menfite' 1963 p. 70: the function was to highlight the key-places of the myth of Horus and Seth). Seidlmayer (in J. Spencer 'Aspects of Early Egypt' 1996 p.122 ff.) thinks that the construction of these pyramids fulfilled the same ideological needs as the slightly later representations of offerings brought to the royal estates of each nomos. But in the offering bearers symbolism (from Snofru onwards) the figurative system was an extension of the simple device of the offering lists with goods useful for the dead afterlife (table of offerings): the importance and skill of the dead are now shown, beyond the usual titles, also in the visual description of the mass of persons and places involved in the production of goods for the deceased. In the third dynasty a system of radicate administrative organization all over the valley was still in construction and it was therfore necessary that, on the provincial level, the presence of a royal cult within each nome became explicit, as did the request of products and materials that it implies; thus these monuments could reinforce the ideological presupposition of such a state-request giving it a more visible and concrete picture of the authority (and of the presence) of the one to whom the offerings were destined, the king. By this complex theory each nomos had a similar monument as propaganda of a royal funerary estate therein; and many other little step pyramids that would spread along the Nile valley must have been now destroyed or impossible to be identified. Furthermore this interpretation implies the theory (of K. Baer) of the presence of royal cults for the living pharaoh was real. Though accepting the conclusions of Seidlmayer we must make here a critic onto its presuppositions: the emphasis that he puts on the 'fiscal' character of the goods gathering through funerary cult or state ceremony seems to make it the first stage in the process of development of the administration and relative bureaucracy; but this understates the fact that, at that time, the administration system had already much more than half a century of life behind its back: it's proved by the officials' titles and by the names of administrative offices on the vessels and labels inscriptions from the early protodynastic (cemetery U at Abydos, Dynasty 0, Naqada III a,b) until the age of the Thinite Kings of the first dynasties. What for me distinguishes the oldest periods from the one we are examinating is more of quantitative nature than qualitative; thanks to accessory means such as the one hypothized by Seidlmayer (but certainly as well to the very installation of state administration offices in all the nomos), the provincial and decentralized organs of government are actually configured as an instrument of the state for which they now begin to work with efficience. M. Lehner (The Complete Pyramids 1997 p.96) concludes in this way the page on the Provincial Step Pyramids: "These ... may have been symbols of living sovereignity, hinting that the step pyramid stood for more than the royal tomb, the marker of a dead king. It is interesting that Huni took the pyramid to the provinces just before people and produce would be brought from the provinces to the core of the Egyptian nation for building the largest pyramids of all time". Concluding, the progress under the third dynasty is not really a matter of creation of a bureaucracy, but indeed its employment on a wider scale and in a more and more centralized way than in the Naqada III phase. For Kaiser 'the(Elephantine) pyramid seems to have represented the fictive presence of the king , was a symbolic means of reinforcing state control implicit in Elephantine's role in the collection and distribution of goods'. in N. Swelim 'Some Problems...' (1983) p. 100 ff. ; and A. Cwiek in G.M. 162 (1998) p.39-52). I can add that Early Egyptian history had frequently shown us that those peoples and their kings not seldom showed to have learnt by their predecessors' mistakes: more than half a century of appearent failures in funerary complex construction, must have been a heavy influence to deal with for Huni; he could have thus preferred to express part of the symbolism and function the pyramid had, preferring to do this by a number of smaller monuments, easier to accomplish, than with one massive building; this would make Snofru the builder of 4 pyramids (Meydum, Seila, Dahshur North and South, as many scholars following Stadelmann's theory do currently believe) and it would imply a major and repentine organizative and logistic effort happened during Snofru's reign, who would have managed an higher volume of stone than his son Khufu (Cheops). It was once thought that Huni had built the 'Romboidal' or 'Southern' pyramid at Dahshur. This is surely uncorrect. What remains to be fully proved is the attribution of the Pyramid of Maydum. The Meidum Pyramid was credited to Snofru by the New Kingdom graffitos calling it 'beautiful temple of Snfrw'. Today the belonging of the Meidum pyramid is still disputed (between Huni and Snofru); it appears certain that the Dahshur pyramids were both made by the foundator of the IV th dynasty, whereas the one at Meidum, albeit what was thought about it by the New Kingdom egyptians, might have been the funerary monument of HUNI; it is furthermore very very probable that the same Snofru tried to make of that 8 steps pyramid a true 'smooth-edges' pyramid, perhaps causing the collapse of its revetment. (Once again note that THERE'S NO CONCRETE PROOF FOR THE ATTRIBUTION TO HUNI OF THE MEYDUM PYRAMID). On the period of the downfall of the structure there's not concordance among the scholars; the pharaoh Snofrw apparently began his works on it during or after the erection of the Rhomboidal pyramid (Mendelsshon 'Riddle..') and maybe it was the Meidum Pyramid collapse that caused him to diminish the angle of the Dahshur monument. The arabic historian Al Maqrizi described the Meidum Pyramid (XV th century) as formed by five steps , while the graffitos by the workmen who built it represent it with 3,4 or 5 steps. After the relations presented by F. Norden (1737) and R.Pococke (1738) and the brief explorationse of Vyse and Perring (1835) and Lepsius (1845), the monument was taken into higher consideration by Maspero (1882), Petrie (1892, 1910), Wainwright and Petrie (1912), thence by V. Maragioglio and C.Rinaldi (1964). The Pyramid was initially made in 7 steps for 60 m circa of height; it was built around a central core on the four sides of which were laid 6 layers of inclined blocks (74° 5'46''); these, decreasing in height from the nucleus to outwards, formed the steps. Huni modified the monument by adding a new external layer next to the base, increasing the height of the inner layers, piling new blocks on their steps and perhaps adding a eight step on the central nucleus, the top of which was the vertex of the pyramid . After this last phase the height was 82 m circa (160 c.) and the base 122m (220 c.), with a 52° slope. (Note that we refer here not to the slope of the oblique layers -which remained unchanged- but indeed to the imaginary line passing by the edges. Over the second and fifth step as well as on the ground around the pyramid there were found traces of ramps used to carry the blocks above. Each step had to be covered by thick limestone slabs. The descendery, for the first time dug in the pyramid' s mass, is a corridor (0,85 m wide, 1,55 m high, 58m long, with 28° of slope) that, starting from the northern face of the second step (circa 20 m of height, hence few meters above the first step floor), goes down throughin the oblique layers and the core ending with 7 steps,and then,after further 9,45 m, with a little pit; hidden over this pit there's the entrance of a small passage ascending for 6,65 m to the funerary chamber floor, just at the ground level ; the chamber is 2,65m in width, 5,05 m in height and 5,90 m in length; its upper part is not dug in the rock but in the base of the pyramid nucleus and has a (N-S) triangular section (it's covered by a corbeled vault with 7 blocks); the chamber is not on the true north-south/east-west axis of the pyramid but it's very few est of the first (N-S) axis and some meters south of the second (E-W) axis. Some cords and 3 cedar wood poles near the chamber pit-entrance are the only objects found within the pyramid with fragments of a wooden coffin found in a recess of the horizontal corridor (Maspero). Snofru' s effort consisted in filling the steps and applying blocks to support the external smooth revetment. The slope was decreased by few seconds of degree,the base grew to 144 m (280 c.), the height 91,7m (175cubits). (J. Ortiz G.M. 154, 1996 p. 77-91; P. Testa D.E. 18,1990 p.54-69; F. Petrie 'Medum' 1892; D. Wildung R.d.E. 21). The complex was surrounded by a straight wall, 1,4 m thick and 2m high, of which only a trench remained; the original size was m. 210x210 (400x400 c.) later augmented to 220,5 x 236,25 (420 x 450c.) (Testa in D.E. 18). The 210m cerimonial causeway disappears beneath the fields of the valley; it had walls 3 cubits thick and 4c. high its floor was 6 cubits large and 3° 98' 22" inclined; the ramp is almost 4° south than the pyramid East-West axis. The small south pyramid, 26,5 m of base (50 cubits), had four steps, a descendery, corridor and funerary crypt; both Petrie's (Meidum) as Maragioglio - Rinaldi' s (op. cit. III p. 47) publications lack of informations to deduce its possible contemporaneity with the first two construction phases or the third one, thence to Huni or Snofru . We are here in presence of the prototype of the royal funerary monument of the subsequent dynasties, with the pyramid, the satellite pyramid(s), funerary temple, cerimonial way, and valley temple (this latter hasn not been found yet at Meidum); they are pointers of a new architectural typology that will continue to develop at Dahshur ,Giza, Saqqara. It's not sure, as just told, whether these innovations must be credited to Huni; it's much more probable that at least the east temple and the causeway must be attributed to Snofru, whereas nothing can be said about the satellite pyramid and the valley temple; the archaic enclosure wall is surely Huni ' s work. However it seems that the most recent essays on this period prefer to credit Snofru with the whole building of the Meydum pyramid since the beginning of its stepped phase. There is the recent new of the finding of another chamber in this pyramid. The Meidum necropolis is noteworthy for some officials' mastabas too: Nefermaat (another son of Huni and first vizir of Snofru as well as father of Hemiunu, the architect and vizir of Khufu) was buried with his wife Itet in the tomb (M 16) from which the famous 'Geese of Maidum' were taken; not less famous is the statuary group of Rahotep and Nofret, whose tomb (M 6), once again double, produced a beautiful serie of reliefs now scattered in various museums and private collections (cfr. J.E.A. 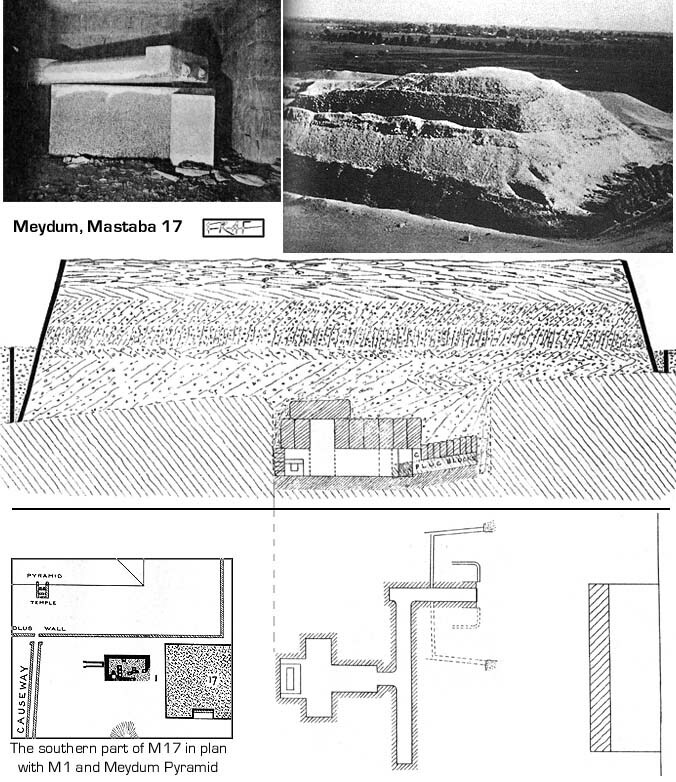 72); the largest mastaba (M 17) is near the east side of the pyramid, but its owner (maybe a royal prince) is unknown. Swelim (op. cit. p.97) thought that the bones fragments found in its burial chamber could be those of Nebkara; but the author supposed,as well, that the substructure could have been built by Neferka and the superstructure by Huni (and Snofru). Not to be confused with the other, earlier , mudbrick pyramid-enclosure (Ed Deir, sub v. Sanakht-Nebka), this huge monument in mudbrick was discovered in 1830s by J. Perring and surveyed by R. Lepsius (1842-3) who assigned to it the number I in his serie of Egyptian pyramids on the Denkmaler (1959). It laid in the easternmost hills promontory in advanced state of ruin. (I.E.S. Edwards in Bard ed. E.A.A.E. p.82-3). 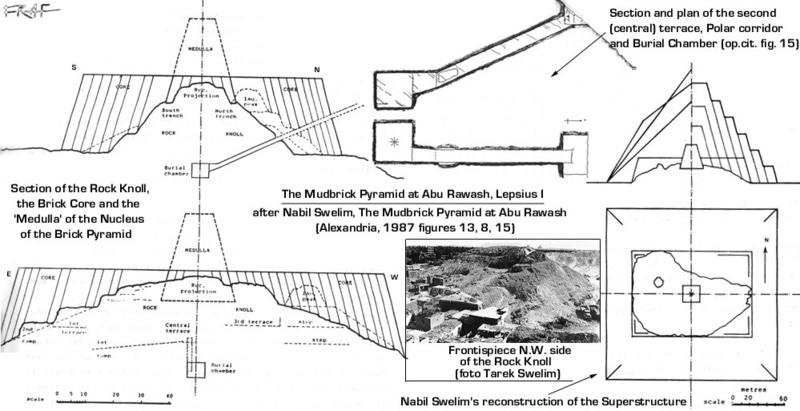 Dr. N. Swelim identified it as a Mudbrick Pyramid, while Edwards (uncorrectly) as a mastaba; a rock core was penetrated from N to S by a 25° sloping corridor leading to a square funerary chamber of 5,5 m of bases and 5 m in height entirely cut in the rock. The mudbricks, inclined inward of 75-76°, laid over the rock core in accretion layers (I.E.S. Edwards cit.). Much of the mudbrick had been stripped away from its position (cfr. photos in A. Dodson KMT 9:2, 1998 p. 36). N. Swelim's researches ascertained the immense size of the monument which had a base length of 215 meters. His reconstruction of the hypothetical height was within the range of 107,5 and 150,5 meters. The Egyptian Archaeologist is the main source on this monument: Swelim has infact published a monography of more than 100 pages and 42 tables on this subject, conducing, with his son Tarek and some persons from the nearby village, an exploration of the site in 1985 (The Mudbrick Pyramid at Abu Rawash Lepsius "I", 1987). He was the first modern archaeologist to consider this monument after the brief investigation by Vyse and Perring, and the somewhat more detailed accounts left by K. Richard Lepsius and finally by Bisson de la Roque (cfr. Swelim op.cit. p. 8-13). The figure above can give a good idea about the system trenches and 5 ramps and 5 terraces which had been worked out on the giant rock knoll which, as in Khwfw, Djedefra, Khaefra and Senwseret II, formed the core of the pyramid. The innermost stratum of the nucleus was called 'Medulla' by Swelim. The burial chamber would have laid just in axis with the vertex of the pyramid. The Middle Kingdom date (in XII-XIII dyn mudbrick pyramids were built) can be excluded by the rock cut core (this kind of substructures is out of fashion already in the end of fourth dynasty), by the giant size of the project, and by the presence of some Old Kingdom burials dug in its rocky inner stratum which had already been deprived of bricks at that time (similar later tombs were excavated during the Fifth Dynasty in the granite step pyramid of Elephantine, in Nineteenth Dynasty on Sekhemkhet's pyramid base steps, and in later periods through the mudbrick superstructures of the Abydos Shunet ez Zebib and Beit Khallaf Mastaba K1); the relation was similar to that of later pits and galleries dug in the (Saqqara) complex of Netjerykhet and in the temple of Unas. The mudbrick monument of Abu Rawash, which would have been comparable in size to the Zawiyet el Aryan Unfinished pyramid (Neferka, Nebkara) and to those of Snofru and Khaefra, was indeed never finished. Its attribution is hypothetical (A. Dodson cit. p. 35-6) and N. Swelim gave also king Neferka as a possible constructor in alternative to Huni. (It's possible that one more mudbrick pyramid, now lost, was erected -but we don't know in which period- at Athribis). Another piece in Brooklyn, a diorite statuette of a god with knife could belong to this reign (or earlier to the IInd dyn. ), while the specimens of Sepa - Neset, Rahotep - Nofret, Akhetaa, Metjen, are chronologically of the III rd to the IV th dyn transition, despite the fact that they were made for personages who were born during the end of the third dynasty. 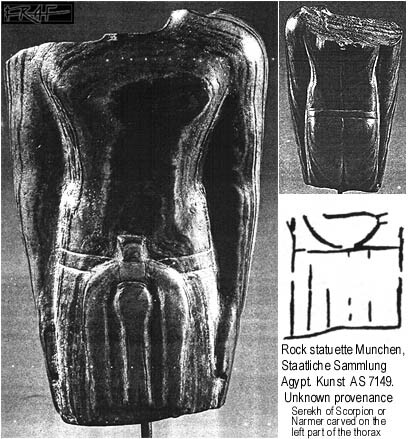 A bit more archaic are the statuettes of Redit (Turin) and expecially Bedjmes (Ankhwa), Nedjemankh, the lady of Bruxelles, Ankh and the Chicago scribe, in harder stone (as the god with knife) and datable to the first half of the III rd dynasty. 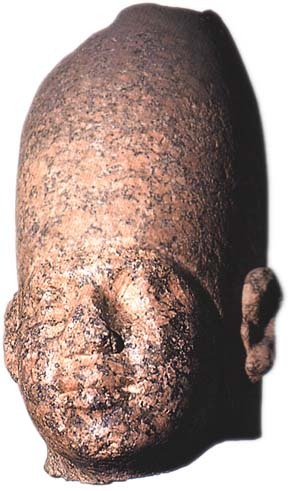 The dynastic change is not very well explainable; we know Huni was Snofru' s father ; despite the necropolis shift from Meidum to Dahshur, nothing can enlighten the motives of the dynastic change. We must keep in mind advices like the ones in J. Malek ' s article on J.E.A. 68 (p.93-106) to understand which and how fragile or empty could be the basis for the traditional Manethonian division into dynasties : a simple erroneous interpretation of annals or lists (as the original from which the Turin Canon was copied) might have made the sovereigns at the head of a document column the founders of that "dynastic" sequence. 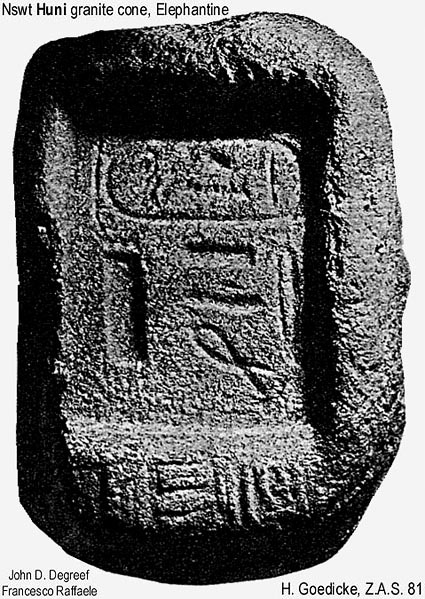 There seems to be a break, between Huni and his poorly known predecessors, in the royal titulary: the cartouche, later a solar sybol, already used by previous kings (Peribsen, Nebka ? ), appears with Huni for the very first time in a preferential position than the serekh; this same serekh, enclosing royal Horus names, is never attested for Huni and for his (?) debated variant Nisuteh, the latter name also found either in cartouche or with no surrounding device at all. About the possible transformations in the religious sphere that these formal changes could underlie,it's evidently hazardous to speculate, in the almost complete missing of any written source; much attention must equally be paid in the attempt to give a backward sense to the informations hidden in the Pyramid Texts : it' s widely accepted that they also echo cults, beliefs and traditions of an older civilization, but their very equivocal character and the mere impossibility to plainly know the weight of the later redactions (V-VIII dyn.) stops easy speculations and prevents from setting diachronically the myths and the teologies enclosed in them. [It seems anyhow almost useless to add that,albeit these methodical precisations,the corpus in question has indeed an unlimited value to catch the ideological framework that it inherits from a more or less archaic past as well as to comprehend the influence it had on the subsequent religious and funerary tradition (Coffin Texts and beyond)]. (cfr. Fattovich in A.I.U.O. 47 (1987) pages 1-14). With Huni the Egypt might have returned to shine after years of uncertainty when short lived reigns weakened its power. This king had, on the contrary, all the time to reorganize the country, for he may have reigned up to 24 years according to the Royal Canon of Turin. This document adds that a building or a city called 'Seshem....' (Seshem-tawy in the Delta ?) was built during his reign; a lacuna doesn' t help to better understand this entry. Thus Huni' s would be the longest reign of the third dynasty (but I don't fully trust these numerical informations). Certainly in this dynasty only Djoser' s reign appears more innovative than Huni' s and it has been obderved how similar is the historical development of the second and third dynasty: both have a middle phase of apparent crisis and a strong, reorganizer sovereign as Khasekhemwy and Huni. The biography of Metjen, dated to Snofru ' s reign, deals with the career of an individual who very likely was born during the second half of the third dynasty. (Urkunden I, 1-7 for the text, Breasted 'Ancient records of Egypt' 76-9 for the translation, Goedicke M.D.A.I.K. 21 for a discussion; Lepsius 'Denkmaler' II 3-7 for his Saqqara tomb). In Lepsius (op.cit. II, 3 col.17) there's the inscription of the 'Heka Hwt Nyswteh' (see picture above), thus the administrator of a land domain which bears this king's name, in the Leontopolite (Zekhemite) IInd Lower Egyptian nome. It's enormously useful because, in its archaic language, gives a heavy load of data concerning the administration and the officials' charges through the titles that Metjen had gained during his life. Contemporary and equally important are the inscriptions from another memphite tomb of the very end of the third dynasty or beginning of IVth: the one of Pehernefer (Z.A.S. 75, 1939 p.63 ff; Helck 'Thinitenzeit' 1987 p. 274-89). Finally we have to note that it has been recently argued (N. Swelim 'Some problems' and Kahl 'S.A.H.' p.7) that the reigns of Qa Hedjet (cfr. supra) and Ba ought to be put at the end of this dynasty; the former king has been here discussed (cfr) while the latter, only known for few inscriptions on Djoser' s Step Pyramid stone vessels, had been previously considered an ephemeral follower of Qa'a at the end of the First dynasty. I think, at the present state of our knowledge, that Huni is more likely the immediate predecessor of Snofrw. Kahl et. al. (1995) consider "Qa Hedjet" the Horus name of Huni. P. Kaplony (R.A.R. I, 1977 p. 146-155; cfr. table in my Third dyn. 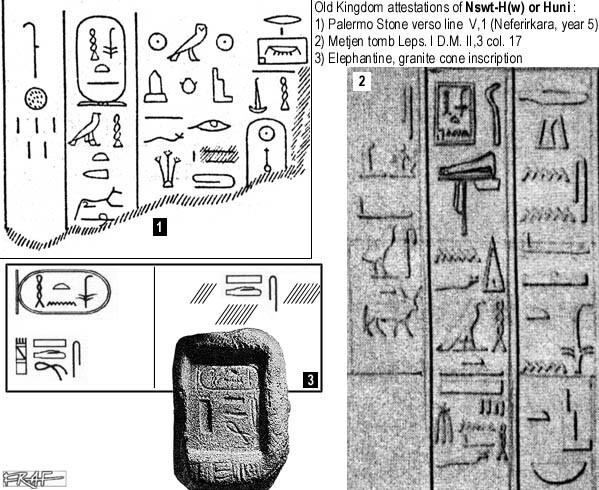 page) identified the the last (6th) king of the dynasaty njswt H(w) with the Horus Neb Hedjet (?) = Zawiyet el Aryan's northern pyramid inscription Neb Hedjet Nwb.